Have fun with your bedroom and take a walk on the wild side! 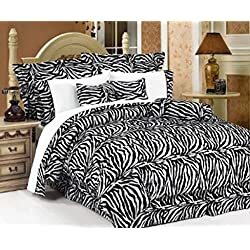 Zebra print bedding for girls is available at a variety of shopping venues and created by great designers in a variety of colors. Zebra styles do not have to be limited to black and white. The Funky Zebra line by JoJo Designs offers pert colors and a cool look for girls from two to twenty-two. It comes in twin, full or queen size bedding sets that include a comforter and pillow sham. 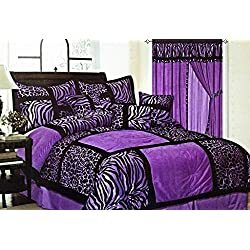 Designed in hot pink, lime green, turquoise or purple accents with the black and white theme, Funky Zebra also comes in matching sheet sets, bed skirts and throw pillows. A laundry hamper, accent rug, wall hangings and lamp shade carry the theme throughout the bedroom. There is also a matching shower curtain to coordinate your adjoining bathroom. Curtain panels and a valance in this pattern finish off the look. Zebra duvet covers and pillowcases for teens are sold at PBTeens. This pattern comes in pink, green, coffee or black stripes on a white background. In addition to an area rug, throw pillows and finials for curtain rods, matching towels and sheets are available. The towels and sheets come in the same colors as the duvet and also come in blue. Traditional zebra comforters are also available at many stores for all bed sizes for those who want the more traditional striped look. J.C. Penny alone has four or more of these comforters from which to choose. Cool comforters in all kinds of designs are available from Wake Up Frankie. Choose from a wide variety of designs such as Moondoggie, Moulin Rouge, Miss Banana 1978 or Shocking Chic. Enjoy the look of Gypsy Dancer, Gaga for Roses and Glamour Girl. Cute comforters can also be found here. Try the Hot Lips, Groovy Doll or Hottie McDottie styles and colors for the cute look. If you want a bedroom like a Jane Austin heroine, damask bedding will give you that sumptuous feel and elegant look. Wake up Frankie’s Damsel in Damask bedding offers that style in colors of silver dust, Kiwi Ice and Grape Ice. He Baroque My Heart is a flocked damask style offered in black on ivory or black on silver. Young ladies will love these romantic choices. Ice Princess is their striped pattern. The bedding sets come in Tiffany Blue, Paris Pink and Lime. The matching dust ruffles, pillow shams and throw pillows do also and complete this look. 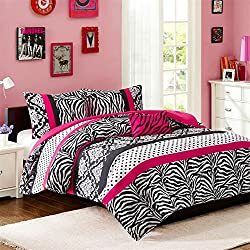 Zebra patterns for girls’ bedrooms are quite popular and plentiful so you should have no problem in finding just the right fashion look to express your inner wild child in your bedroom décor. From toddlers to teens to young adults, there are zebra bedding fashions for all ages and tastes and color preferences. Search online and you will find a wealth of choices in major retail stores and online marketplaces. Zebra print bedding for girls has never looked so good and been fashioned in so many choices of patterns. Enjoy making your choice.